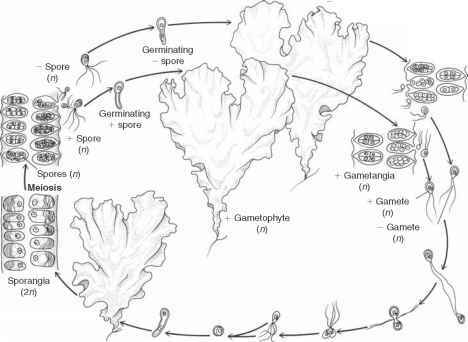 to the embryophytes (land plants). The green algae and the embryophytes are today interpreted as a monophyletic group, the Viridiplantae, consisting of two lineages, Chlorophyta and Streptophyta, the latter of which includes all embryophytes and the green algal class Charophyceae. Although the fossil record of the green algae is extensive, the fossil record has provided almost no information about the evolutionary steps involved in this transition (see Chapter 6). Instead, the phylogenetic relationships between these two groups have been hypothesized based on the study of biochemical, cyto-logical, and ultrastructural features of living taxa (Lewis and McCourt, 2004) and these have been confirmed by molecular phylogenetic studies (Karol et al., 2001; Turmel et al., 2007). There are several late Neoproterozoic microfossils that morphologically resemble members of the Chlorophyta. One of these is Caryosphaeroides, a spheroidal unicell from the Bitter Springs Formation (800-830Ma) of Australia (Schopf, 1968). The cells range from 6 to 15 pm in diameter and lack an outer sheath; a few specimens appear to have been contained within an amorphous organic matrix. Morphologically, these microfossils appear similar to the living green algae Chlorococcum and Chlorella (Chlorococcales). Neoproterozoic (700-800 Ma) shales from northeastern Spitsbergen have yielded a rich, well-preserved microfossil assemblage, including several types morphologically similar to members of the Chlorophyta (Butterfield et al., 1988). One of these is a complex branched structure 10-50pm in diameter and 1mm long. It has been suggested that these structures are similar to the rhizoids of certain members of the Chaetophorales, a group of green algae that possess a prostrate basal system from which arise erect, branching filaments. 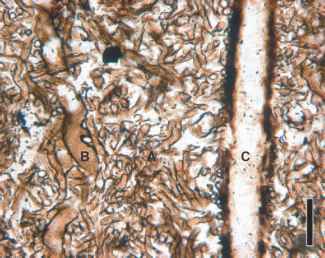 Also included in this shale assemblage are branching, filamentous thalli constructed of cylindrical cells that range from 50 to 800 pm in diameter. Some fragments of this alga were a centimeter long. Certain extant members of the cladophoralean green algae (Cladophorales) are morphologically similar to these fossils.